Lady Gaga and Glenn Close tied for Best Actress at the Critics' Choice Awards Sunday night, but it's what the stars said that really resonated with the audience. Close said she was actually "thrilled" they tied because the world and the industry often "pits us against each other" instead of bringing women together. "I think I can speak for all the women in this room: We celebrate each other,” the legendary actress and "The Wife" star said. Glenn Close, left, and Lady Gaga, winners in a tie for the best actress award, pose in the press room at the 24th annual Critics' Choice Awards, Jan. 13, 2019, at the Barker Hangar in Santa Monica, Calif.
Gaga, who has also been very outspoken about women supporting one another, was noticeably shaken up in a great way after her name was announced as co-winner. "I’m so very happy that you won this," she said, as the two embraced on the stage. 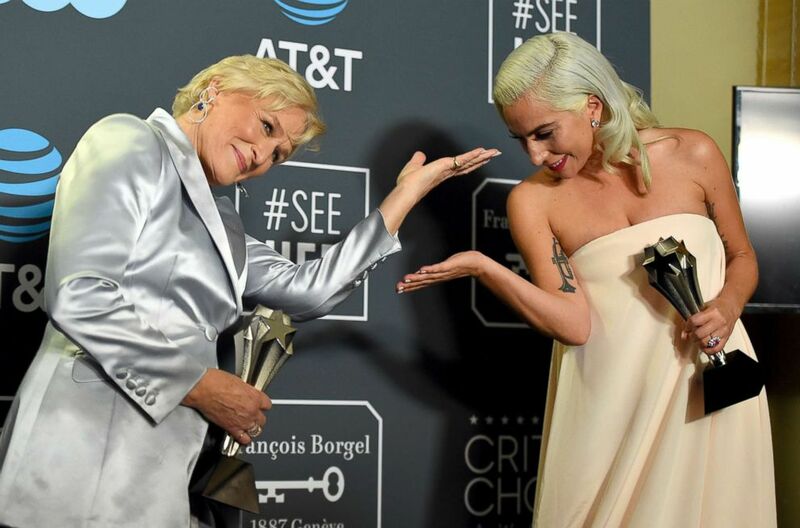 Lady Gaga winner of Best Actress for "A Star Is Born," and Glenn Close, winner of Best Actress for "The Wife,"' walk offstage at the 24th annual Critics' Choice Awards at Barker Hangar, Jan. 13, 2019, in Santa Monica, Calif.
Gaga also made sure to thank her "A Star Is Born" co-star and director, Bradley Cooper, not just for his talent, but for being a "magical" human being as well. Gaga and Close weren't the only tie of the night, either! Amy Adams and Patricia Arquette both won for Best Actress In A Limited Series Or Movie Made For Television. They also stood on stage in embrace, supporting each other.